Southern deep fried chicken has never tasted better with this crispy and crunchy chicken recipe. With this recipe the chicken stays juicy, is packed with flavor, and stays crispy and crunchy. I just get so excited talking about southern fried chicken that's juicy, crispy, and crunchy? Boy does this chicken sounds good! If you're ready for some good eats I recommend you dust off your deep fryer and get ready to cook southern fried chicken the easy way. I prefer to deep fry me chicken in the comforts of my home using my old fashioned deep fryer. By using my deep fryer I can almost always guarantee that my chicken turns out just right. Besides, if you use a deep fryer, cooking crispy chicken really doesn't get any easier. If you don't have a deep fryer buy one as soon as possible. In the meantime, you can use a heavy bottom or cast iron frying pan to get the same results. 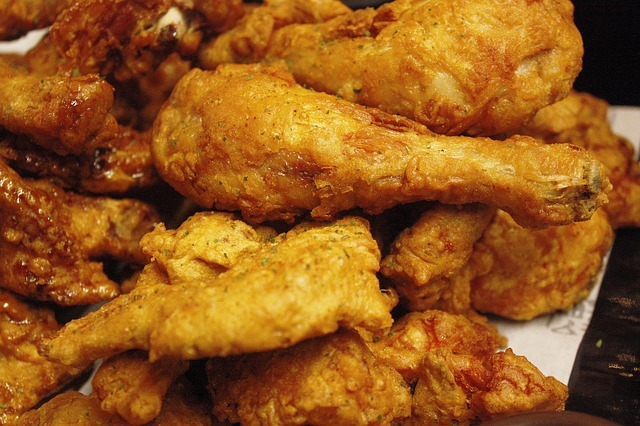 Treat yourself today, by cooking up a helping of deep fried chicken. Here is the recipe to follow. Wash chicken and pat dry with paper towels. Pour buttermilk into a large bowl. Place chicken into bowl and soak in your refrigerator for about 4 hours. Now it's time to form your mixture. In another large bowl, crush cornflakes well. After crushing cornflakes add flour, seasoning salt, garlic, onion powder, cayenne pepper and poultry seasoning. After about 4 hours remove chicken from the refrigerator. Place egg yolks into a small bowl and beat until smooth. Find yourself a paper or plastic bag that will be used to shake the chicken. Now place enough mixture to coat a piece of chicken into the bag. Dip a single piece of chicken into the egg yolks and then shake the chicken in the mixture. Do this twice for each piece of chicken. Allow your chicken to sit at room temperature for about 10 minutes before frying. Follow the instructions on your deep fryer for preparing and heating your oil. When the oil is ready place your chicken into fryer and cook until done. The chicken should be golden brown, using tongs turn the chicken if necessary. Don't overcrowd the fryer. Tip: If your chicken is freshly butchered you can draw the blood away by soaking your chicken in cold water for up to 2 hours. Enjoy your Southern Deep Fried Chicken.